I never thought I’d be a precious parent till I actually became a mom and though I’m not at Pinterest level yet, I’m close enough to be giving myself guilt trips when I didn’t have time to bake muffins and gave my toddler store bought ones instead. Ah, Mrs. Gore, you’ve nailed it again. I loved Jen’s article, but I love yours even more. So gracious, with that dash of humor. Yes, God has made us each unique and has placed our children in our homes for a reason, whether biological or adopted. They need our kind of crazy! 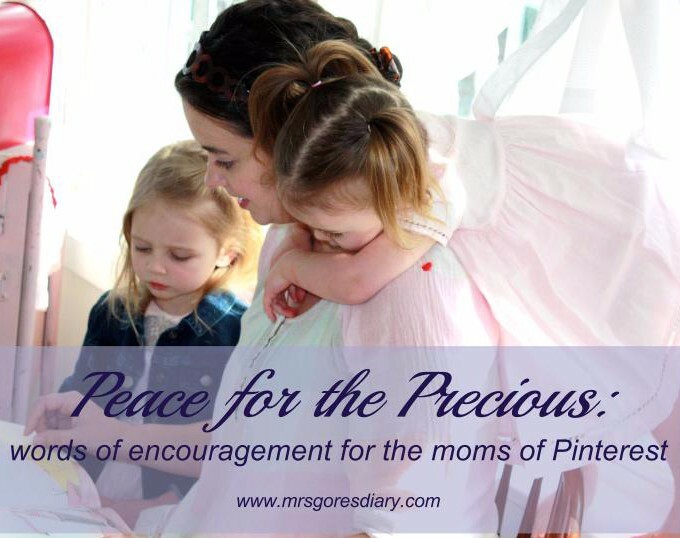 Thanks for reassuring moms of all types that they are enough, especially with God’s help. Live in your strengths without apology. Bless you and your family. I love your preciousness…is that a word and I adore Jen too. It does take lots of different mamas to make the world go around! I’m planning an Avenger party for when the movie comes out and my kids are grown, laughing, so my friends join in my madness! Beautifully written. I absolutely agree that it takes balance, and we each mother how we know best. I was raised how Jen describes. Yes, I knew I was loved, and my childhood was happy, filled with imaginative outdoor play and neighborhood friends. However, I am hard-pressed to recall a fond childhood memory that involves my parents, and that seems a shame. I feel like that dynamic really impacted the relationship I have with them now. While we are friendly and keep in touch, we certainly are not close. So I want something different for my daughter. While we’re not “precious” (I barely remember most holidays, and she’s never had a special occasion outfit), I definitely tend more toward attachment parenting. I want her to remember that mom climbed trees, splashed in the creek, and played on the floor with her. Oh, I so needed to hear this! Thank you for following Gods lead in the personality he gave you. It’s been a long time since I was a mother to younger children (my youngest is 26, lol) but as I watch my oldest mother her 3 year old I am reminded of how I used to be. I love your preciousness! You make me want to go hug my own kids! I used to be much more into special parties, etc, but as our family size grew, I often focused (focus) on ‘good-enough’ for survival. Your sweet personality and love for your family shine through in your writing. I love seeing all the different kinds of good Mamas out there! Anyhoo…..if you were not, as you say, precious. Well, you would not be Lesley. And if you were not Lesley, my heart would break. I love you so stupid much. I am SO not precious. Helicopter, perhaps. Well, yes. Yes, I am a helicopter. But precious in terms of crafts and birthday parties and tea times with baked goods? Certainly not my style. I have no pinterest account, and indeed, have only peeked at pinterest twice — by accident, when it has come up in a google search. It’s just not part of my world. We all have different gifts. That’s what makes us so diverse. I think it’s sad if a mother feels a need to measure up to another mother in an area that’s just not her area. And I absolutely agree with you. God gave our kids to us — yours to you, mine to me, hers to her — because He knew what those individual children needed. And if I am doing my best for my children, I have no reason to feel discouraged.